Red Stag Casino will then reward you with a bonus (Welcome Bonus is for new players only). The terms and conditions of the bonuses vary between different casinos and might also change over time and between different countries, so it is important to compare the different offers and read the T&C for Red Stag Casino before signing up. Red Stag casino runs on WGS Technology slots that is one of the few platforms that accept players from the united states, They deliver a highly diverse variety of different slots ranging from classical 3reels to more complex and exciting 5reeled slots. Some of their popular titles are, Lucky Irish, Funky Chics, Amazing 7s among others. One of the benefits of playing on WGS slots is that all of them has a jackpot available practically on every slot they offer. With over 170 + games to choose from Red Stag sure has a diverse collection games to choose from, the slots are categorised for you to easily find the ones that you like you can choose from 3 Reel Slots, 3 Reel Slots Bonus, 5 Reel Slots, 5 Reel Slots Bonus, 7 Reel Slots and Traditional Slots. As mentioned above the casino manages to deliver quite a few exiting and fun titles ranging from classical slots to themed slots with farm animals, leprechauns, Candy, on top of lots of other themes. 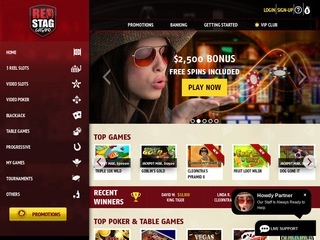 An extensive portfolio of virtual table games are offered on Red Stag. Try your luck on classic games such as Baccarat, Blackjack or Roulette. The casino has a especially large collection of video poker games if you’re a poker enthusiast Red stag is the perfect place for you. Some of the titles in this category are, Multi Hand All American Video Poker, Deuces and Joker, Perfect Pairs, and US Blackjack. If you ever get bored of table games and slots Red Stag offers players a small category with Specialty games, including games such as, Keno, Bingo and some varieties of different dice games to play at your leisure. Unfortunately, this is a category that is still lacking on majority of casinos that accepts players from the US but its something we hope to see in the future. 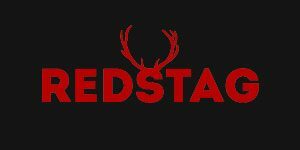 Red stag has a decent selection of the most common methods of banking everyone usually has one of these available the methods are, American Express, Neteller, Paysafe Cards, Visa, Sofotuberwaisung, Quick Cash and Skrill. The weekly withdrawal limit on the casino is currently 2000$ / week so if you win for example 10000$ this will be payed out 2000$ weekly until your win has been payed out in full. Red stag has a dedicated support team that’s available 24 hours a day 7 days a week to help you with any problems you may encounter on the casino this is through their live support option. If you’d rather speak to them they also offer a toll free number to call them to get help. The casino is also active on social media such as Facebook for general questions. The casino also provides an extensive F.A.Q that answers all the most common questions casino players usually have.